On a serious note, I recently came very close to unwittingly purchasing a dog from a puppy mill. Here's the short version: We all know not to buy from pet stores but if you're considering buying a dog from a breeder, know that they could be a "commercial breeder" or what some would call a puppy mill. Search for their operation on this USDA Registry of Commercial Breeders. You can even read reports written by federal inspectors of their facilities. For more information on puppy mills and how to avoid them, read this article by the Best Friends Animal Society Network. 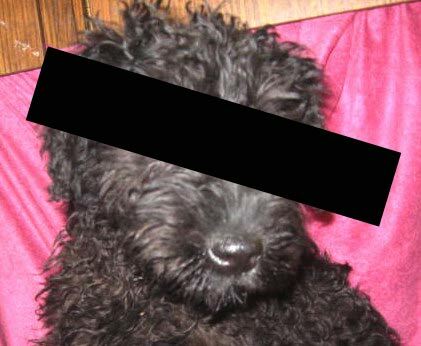 My search for a Kerry Blue Terrier puppy began with contacting local breeders recommended by the KBT Foundation. We found no puppies, only waiting lists, so we kept looking and found a nearly perfect puppy in an online ad. The dog was states away in South Dakota, but the breeder offered to ship her anywhere in the U.S. From the start, the arrangement seemed too good to be true. At this point I smelled puppy mill. While there is no shortage of websites enumerating the horrors of mills, only a few suggest how to avoid them other than "don't buy from pet stores." Short of confronting the breeder, I had no way to confirm my suspicions. So I dug deeper online, found the following info, and decided to make it available here. The United States Department of Agriculture regulates a certain number of dog breeders in the US known as "commercial breeders." This type of breeder is infamous for emphasizing quantity over quality, sacrificing good genes, good sanitation, and good business ethics in order to maximize profits. Some people call them puppy mills. Fortunately (and I wish I'd known this all along) the USDA has a searchable database of it's commercially licensed breeders. For a great primer on how the USDA is involved in commercial dog breeding read this article by the Best Friends Animal Society Network. This database even pulls up site inspection reports written by veterinarians who visit these commercial breeding facilities. While reading the past three years of reports on our potential seller I went from almost ready to purchase, to inwardly angry, to noticeably upset. I initially thought I was dealing with a casual "backyard breeder" who just happened to have a puppy available, yet these reports revealed approximately 60 adult dogs on the premises. From 2007 onward this woman's kennel has been cited for various sanitation and health code infractions including exposing her dogs to rodent feces and one case where two wire mesh runs were placed on top of each other, exposing the lower dogs to excrement falling from the upper run. I won't name names and I'm not saying that all the people in this database treat their animals poorly. Conversely, if a breeder isn't on the list it does not mean they are an above board operation. They might just be operating outside of federal regulation. To summarize, a lot of people will tell you not to buy from a breeder, period. That you should only adopt from one of the millions of shelter dogs. I hear that but some people want specific breeds for specific reasons. If you're looking for a purebred animal, do A LOT of research. Look for reputable clubs devoted to your desired breed and contact breeders they trust. If you happen to find a breeder that you can't seem to get any info about, use the tools linked above. You might be surprised what you find. I feel sorry for the dog I almost bought, that poor little pup, but I just can't take the risk of health issues and other potential problems that come with a puppy mill dog. More importantly, I won't reward this woman for mistreating animals and neither should you. Now go read some of the more light-hearted BS hardtolive.com has to offer. Please don't feel bad for not buying the dog because that would be perpetuating the cycle of puppy mills and keeping them in business, while three million dogs and cats are killed in US shelters annually. If everyone would stop buying from pet stores, classified ads, the Internet, and backyard breeders, millions of dogs wouldn't have to die in shelters because of lack of homes. Almost all of the people selling dogs from puppy mills will lie to potential customers regarding where the puppy came from. Please, everyone, obtain your puppy or dog only from shelters, rescue groups, as strays, or lastly, from REPUTABLE breeders if you must. Puppy mills are horrific places for the dogs spending their whole lives there, and because the dogs produce goods (puppies) like in a factory while millions of dogs die in shelters. It's crazy and makes no sense. This is great advice, and thank you for posting it, but I want to point out that if you're looking for a specific breed, you can use websites like petfinder.com to search by breed in your area. You can also look for breed-specific rescue groups using Google (or your search engine of choice). Thank you for the link to the USDA breeder registry site; however unless a person is willing to give up ALL their PERSONAL rights and information on their PERSONAL computer that link is NOT a viable place to search! As per the site's warning:"
* You are accessing a U.S. Government information system, which includes (1) this computer, (2) this computer network, (3) all computers connected to this network, and (4) all devices and storage media attached to this network or to a computer on this network. This information system is provided for U.S. Government-authorized use only. * Unauthorized or improper use of this system may result in disciplinary action, as well as civil and criminal penalties. o You have no reasonable expectation of privacy regarding any communications or data transiting or stored on this information system. At any time, the government may for any lawful government purpose monitor, intercept, search and seize any communication or data transiting or stored on this information system. o Any communications or data transiting or stored on this information system may be disclosed or used for any lawful government purpose. o Your consent is final and irrevocable. You may not rely on any statements or informal policies purporting to provide you with any expectation of privacy regarding communications on this system, whether oral or written, by your supervisor or any other official, except USDA’s Chief Information Officer. So much for the "Freedom of information Act"! I totally understand what it's like to have trouble finding a specific breed. You really want that dog, but you want to obtain it responsibly. And, let's be honest, you don't want some lemon of a pooch. It can be daunting. Take my case, for instance. I'm on the hunt for a coyote/standard poodle mix. You might think that with the poodle mixes being so popular these days that my task would be an easy one. Sadly, I have not had any luck in almost eight months of searching. One lady in California told me she didn't know much about dogs but assured me she could make it happen. I think I know what she had in mind, and I'd do it myself if I was sure there were homes for the entire litter. And I could do it for less than the $10,000 she wanted. Of course, I'd have to go to all the trouble of finding good breeding stock and putting the mother up for the gestation and weaning period. A lot of work, for sure. But not $10,000 worth of work. What I'm imagining now, as an alternative to my traditional, fruitless puppy search, is a sort of cooperative where I organize other desirers of coyote/standard poodles and we share the costs of breeding. We could take steps to ensure the well-being of all puppies and their mommy and daddy dogs. I reckon we could give a significant price-break to the coop member who hosted the birth and weaning. Seems fair. A quick thought: Unless we find a fully-domesticated coyote, we might aim to do this project with a female standard poodle. That way no one is trying to take care of a pregnant wild animal/new mother in his or her utility room. Seems wise. If you're interested, leave a post here on HardToLive. I'm posting anonymously for now as a result of some of the poor reactions I have received upon inquiring about coyote/standard poodle mixes. Not everyone gets it. If you do, and you want one of your own, leave a note and I'll be in touch. Nice, I'm a happy owner of german boxer it is not that rare still . I bought him in another country and got all his documents via virtual dataroom .